Potatoes can be prepared a number of different ways. 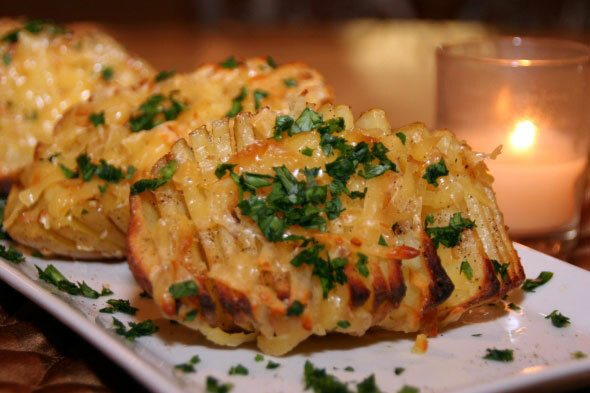 If you haven’t tried them hasselback style, your missing out on a potato that is crispy on the outside and tender on the inside. My favorite part is the elegant presentation that looks fantastic aside a number of main entrée dishes. I used White Rose Potatoes for this recipe. If you can’t find small sized potatoes you can cut them in half as I did. You don’t want the potatoes to be too large; otherwise it will take longer for the centers to cook. An easy way to cut the slits is to place each potato on a wooden spoon while slicing. It will help balance the potato and prevent your knife from slicing all the way thru. No need to use the exact recipe amounts for this dish. Use as many potatoes as needed and adjust the other ingredients accordingly. Have fun with it and be generous with the garlic and cheese! These crisp on the outside and tender inside hasselback style potatoes make an elegant side to any meat, poultry or seafood dish. The smoked gruyere cheesy topping makes them even better! Preheat oven to 425 degrees with rack in the center and line a baking sheet with a large piece of foil. Mix garlic and ¼ cup olive oil into a small mixing bowl. Cut each potato in half on the short side to make 6 halves. Carefully make thin slits starting on one end of each potato (slicing on the short side of the potato) all the way to the other end (about 1/8 inches apart) about ¾ of the way thru, leaving the bottom attached. Place potatoes on foiled baking sheet. Generously sprinkle with sea salt and black pepper then spoon garlic olive oil mixture all over potatoes, gently rubbing garlic pieces and oil into the slits without breaking. Bake potatoes for 30 minutes. Drizzle with a tad more oil to keep potatoes moist. Bake until tender, about 15 minutes longer. (Fold foil over and cover if edges start to burn) Remove from oven and sprinkle cheese all over tops. Switch oven to broil and cook until cheese is melted and begins to brown, about 3-4 minutes. Remove from oven, lightly sprinkle with additional sea salt and fresh ground pepper, top with chopped parsley and serve.